David Henneberry (1798-1849) married Jane Cushing (1802-1881) on January 21, 1819 in Christ the King Church in Galbally, County Limerick, Ireland. Along with their twelve children emigrated from Cork, Ireland aboard the ship "Argyle" and arrived in New York on June 17, 1848. Galbally is one of Ireland's most picturesque villages situated in the majestic Glen of Aherlow and just nine miles from Tipperary Town. 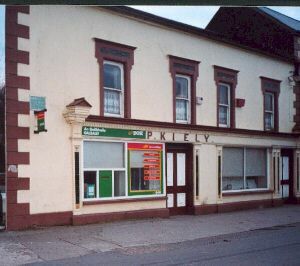 The village won the overall National Tidy Towns Award in 1994. Galbally is an ideal location for a wide variety of activities. It has indoor facilities for badminton and handball, outdoor tennis and basketball and a number of sports fields for rugby, soccer and Gaelic games. Galbally is also an ideal base for hill walking and guided or mapped walks can be arranged. During the 9th century, the Vikings had established strongholds in Ireland. A village called Cu was located near Galbally in County Limerick and the Cussen surname may be linked to the early Vikings. 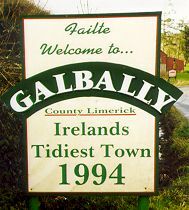 Galbally (An Gallbhaile) in Irish, means "Townland of the foreigners." Although most of the Vikings were from Norway, some who were from Denmark, and they settled near Limerick in the 9th century. The Gaelic term for the Danes was "Dubh-gall" or dark foreigner, and the term for the Norwegians was "Finn-gall" or fair foreigner. The Normans were Vikings who established settlements in France during the late 9th century. The consistent attacks on the Franks in 888 provided opportunities for new settlements in what later became known as Normandy. The medieval Latin name for Viking is "Northmannus" and the name for Normandy is "Northmannia" (Viking Land). William the Conqueror (a Norman duke) defeated the Anglo-Saxon forces at the Battle of Hastings in 1066 and assumed the English throne. The Norman invasion of Ireland started in 1169 and within the next century, they controlled 75% of the country. The majority of Irish towns were established by the Normans who spoke Norman-French. The province of Munster became one of the most predominant French (Norman) settlements outside of France. Galbally is located within Munster. Fishermen are also well catered for. Near the village is Hillcrest Riding Centre where treks through the surrounding countryside can be availed of. There are also a number of excellent golf courses within easy reach of the village. Galbally offers a wide range of accommodation from hotels to B&Bs to self catering thatched houses. Those interested in geology or archaeology will find Glencliff Gorge, just north of the village, of great interest. It was created by a glacial overspill and melt waters torrent from a pre-glacial lake. Darbys Bed is an ancient site from which much fable and folklore abound. It is a majestic passage grave dating back almost 4000 years and legend has it Diarmuid and Grainne rested here on their flight from the angry Fionn MacCumhaill. The graveyard contains the ruin of a 13th century church. Moorabbey on the road to the Glen of Aherlow was a Franciscan Abbey built in 1204. The pass through the glen was an important route to Tipperary. Three of its friars were martyred there in 1570 and the story goes that on being beheaded no blood flowed from their necks. There is a tourist information office open during the summer season. Galbally is an ideal place to spend a relaxing holiday and is also a great base from which to visit other areas of interest as it is just 24 miles from Limerick City and less than 50 miles from Cork. The population was 246 from the 1996 census.